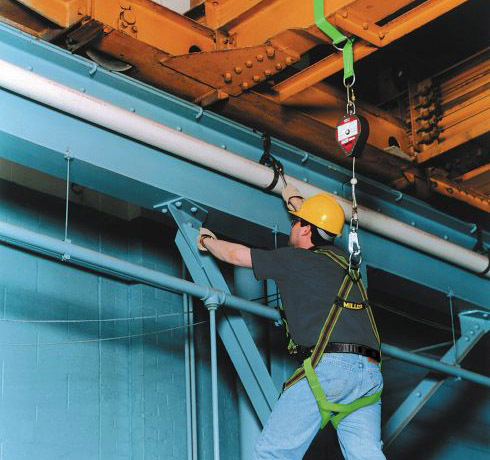 Professionals looking for self-retracting lanyards or lifelines for their next project will be pleased with the selection at National Ladder & Co. We have a wide line of products for all your fall equipment needs as well as a variety of other products. We proudly offer Miller’s line of fall protection, a trusted brand with safety and comfort in mind when it comes to all their products. All of Miller’s products provide the safety you need by reducing risks for your employees by using the proper equipment. The increase in productivity is another quality of Miller’s fall protection products, since they are versatile and offer a greater mobility than other brands. The lanyards and lifelines feature quick to activate braking systems that require less fall clearance, which decreases hazards for employees. These self-retracting lanyards & lifelines are an affordable and light weight alternative to shock-absorbing lanyards. National Ladder & Scaffold Co. is a family business that has been located in Michigan since its opening in 1935. We have the widest selection of equipment for all your needs for your workplace or next big project, which we offer at the lowest prices. Between our two base locations in Michigan and our online store, we can ship anywhere you need us to in the country still while having the best shipping options available.